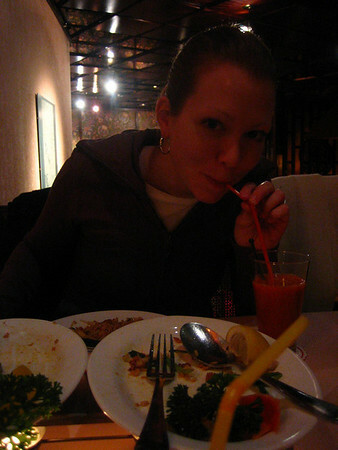 i just came across some photos i made of my sister eating at a thai restaurant, once in 2002 in nyc, and secondly in 2008 in lausanne, switzerland. my mother (a professional analog photographer) used to take a series of photographs many years apart at the same location with the same sorts of clothing. if i can find it, i will try to scan the treehouse series (photos probably in a box of mine in storage in california), with my sister and i sitting in the same place in our treehouse many years apart. at any rate, my sister and i remembered that i had shot a few photos in nyc at my favorite thai place in the east village, tara thai. this came to us when we were forced to improvise dinner plans in lausanne last year because a vegetarian restaurant no longer existed. we managed to convince our waitress to make thai iced tea as well, which the thai restaurant in lausanne insisted was only a summer drink. we didn’t look at the original photos when we reshot, only what we remembered. it’s mind boggling what the human memory can retain six years later from a favorite photograph. 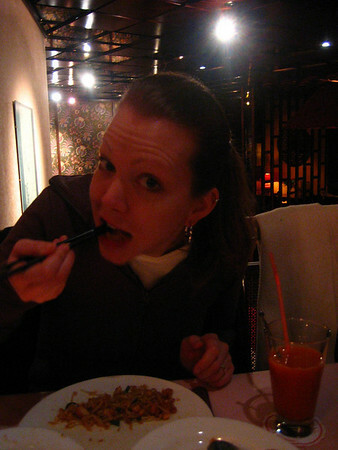 either that, or my sister has some sort of inherent thai food consuming pose coded into her dna. either way, i find it fascinating.